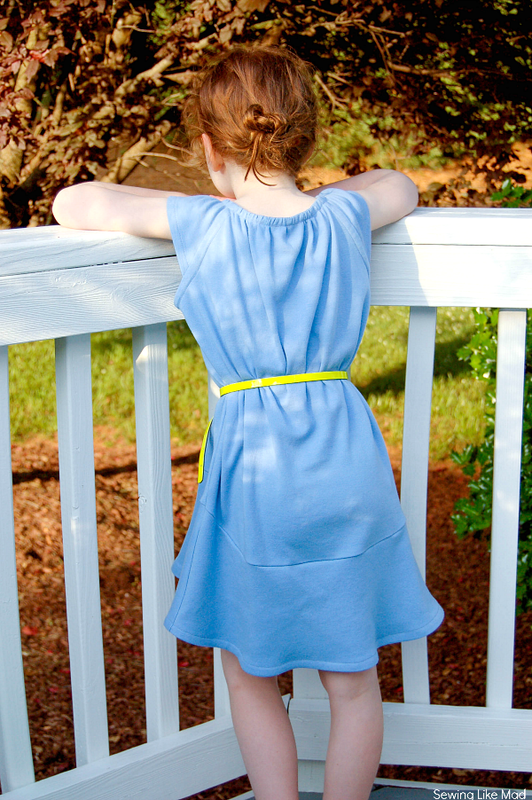 Sewing Like Mad: Organic Cotton Plus - Fabric Review & Giveaway. Organic Cotton Plus - Fabric Review & Giveaway. 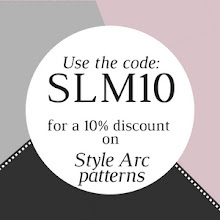 Wohoooo, it been a while since I had a giveaway on the blog and THIS is a good one! A while ago I got contacted by the nice people at Organic Cotton Plus. They asked if I wanted to review some of their fabric? In other words I turned them down.....KIDDING, I said yes as fast fast as I could! But I also asked if they were interested in sharing their loveliness with you? And I told you they were nice, because they said yes! At the bottom of this post there is a Rafflecopter where you have a chance to win a $50 gift card to their web shop. Open for International participants, yay. But please don't miss the post itself. I choose to receive this great organic cotton interlock (color: cornflower) and made a heavily remixed version of a dress from Happy Homemade vol. 5 (Japanese pattern book). And this ooooooh so lovely organic cotton fleece (color: a dusty coral) which turned out to be a sweatshirt fleece - a pleasant surprise because that was really what I wanted. I made The Hawthorn Zip-up Sweatshirt from Willow & Co / Titchy Threads with remixed pockets. More about that later. Let's talk about the dress and the fabric is it made of first, shall we! The interlock is super soft and with a great drape and yet staple enough to sew with a normal sewing machine (not serger). That means more possibilities for sewing more detailed garments without the need of a overstitch or annoying twin needles (yeah, sorry I am not a fan - I think I am under some sort of twin needles spell). I pre-washed the fabric of pure habit - even though there are no chemicals to wash out since it is organic, yay. I did not notice any shrinking but there was a tiny bit of peeling - but seriously only a tiny bit and nothing surprising for cotton knit fabric. It would NEVER hold me back from ordering it again. The dress is a remix of a remix of a simple raglan sleeved, gathered neckline, loose fit dress. I remixed it the first time for STYLO, vol 1. See it HERE. For this remix I skipped the button placket, made it even more high-low and changed the sleeves to sort of half-sleeves. When you do a half-sleeve you have to find a way to finish off the rest of the armscye under the arm. I used home made bias tape. 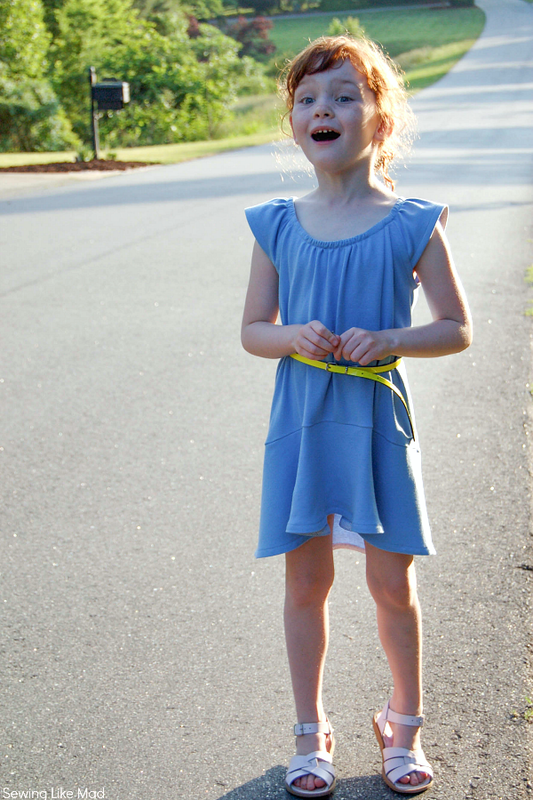 You can find a tutorial on hemming with bias tape HERE on my blog. And since I was hemming the armscye with bias tape I decided to do the same with the sleeve hem as well. It turned out pretty neat looking as you can see above. By the way the neck line is hemmed with bias tape too. The dress is finished with a flounce (non-gathered ruffle). The more circular you make it the more wavy it will be. You will notice that it is more wavy at the front than the back. 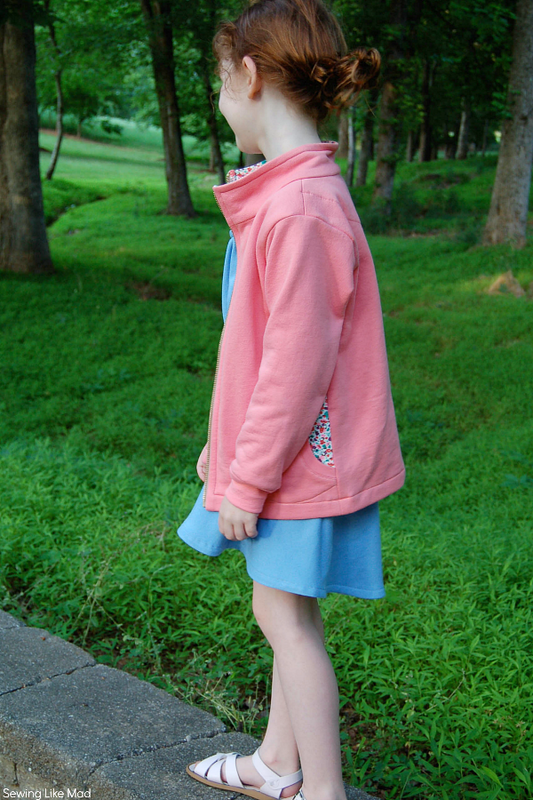 Let's talk about the coral sweatshirt fleece and the Hawthorn Zip-up Sweatshirt. I am so so in love with this quality. It has a nice smooth surface and then the MOST soft back side ever - like teddy bear soft. The ultra teddy bear softness disappear in first wash but it turns into a normal and still very lovely soft back side, so it is all good. Unfortunately this color is sold out since I ordered it and is being discontinued but HERE is a link to the other beautiful colors of fleece and French Terry that they carry. If you are in love with the color (like me) they have other qualities like THIS thermal and THIS rib (on sale, woohoo) in that color. How stunning is that thermal!? To sew a Hawthorn Zip-up Sweatshirt in this material is a match made in heaven. Perfect material for a perfect pattern. Wilma could literally not wait for me to finish. And luckily we are not having the usual blasting temperatures every day yet so she has been able to wear it a little bit. It will be so SO perfect for fall. The Hawthorn is a Willow & Co pattern designed by the lovely Laura from Titchy Threads. And you all know that her patterns are basically perfection. A ton of attention to detail, wonderful finishes and a tutorial that will help you through and maybe even teach you a new thing or two. I know I did, while making the half zip version for the lookbook. Blew my mind! I did a few changes to the pattern. One was changing the pockets from classic inseam pockets to this ehhhh crescent-opening-with-rib-pockets. What, you never heard of that pocket before? Ahem. I love that it gave me the chance to add a sneak peek of another fabric. A leftover piece of cotton interlock I found in my stash. There was just enough for facings along the zipper and inside the collar, back neck facing and the pocket facings. The second change I did was shortening the length from fitting a 20" zipper to a 18" zipper - which basically just meant that I made it 5 cm / 2" shorter. I wanted it to have more of a short jacket feel. Now all I have to do is make another one for my youngest daughter because otherwise I predict fist fights over it. It is a VERY popular item in the house at the moment. They love the cosy feel this sweatshirt and fabric gives them. Score! And you can buy all the lovely wonderful organic cotton fabrics HERE. Thank you Organic Cotton Plus for reaching out to me. It was an absolute pleasure to work with your materials and it will certainly not be the last time. In fact I have already my eye on all the stunning colors of twill they sell. Okay, NOW you can go enter that Rafflecopter. beautiful mie! i am going to have to check out how you did the bias tape. looks so amazing! Very beautiful. I wish i could see like that. I cross my fingers and hope for good luck. Thank you for an inspiring blog. 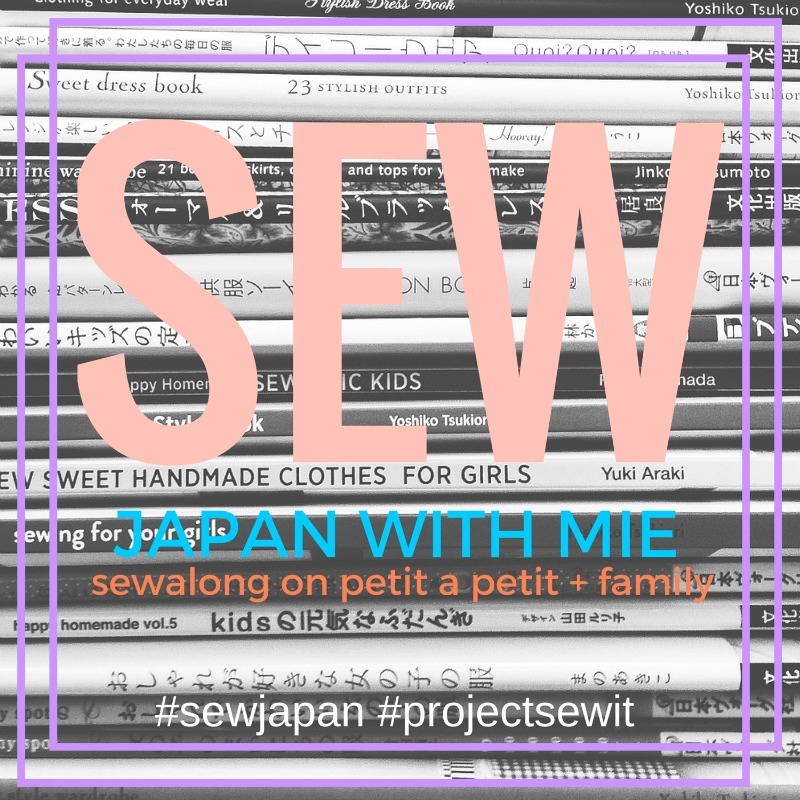 Mie this is sewing perfection!! Those sleeves are AMAZING!! I love every single detail of both the dress and the jacket (love the pockets btw). I want to make this dress!!! The fabrics look so "yummy" I can't decide on what I would buy... Amazing job!! I think I would choose to twill in avocado to make some trousers out of, but there's a huge selection of lovely fabrics. I love what you've made, I especially like your pocket detail on the top. Love the pockets on the jacket, makes the whole thing much more feminine. I am always looking for French Terry. My kids love shorts made from it in the summer! These are beautiful. I especially love the flower fabric peeing out in the Hawthorne! and I would definitely use my voucher to buy some interlock stripes! I want this: http://organiccottonplus.com/collections/wovens-colorgrown/products/solid-woven-dobby-colorgrown-60-wide for some Darby Capris I want to make my daughter for part of a White Rabbit Costume. i would probably get some of the cave drawings fabric. Some mustache interlock and some french terry. I would probably buy a selection of rib knits... they are so hard to find locally! Also, I hate twin needles. Your pockets are perfection. I would love to win this giveaway! My daughters need some new sweatshirts! Love your blog and would love to win the organic cotton prize. Have sewed for many many years and love organic cotton. oh what a perfect outfit! love how you finished the sleeves of the dress with the stripe, that's a great little detail. i'm obsessed with french terry lately - i'd go for some in amethyst to make some true bias hudson pants. thanks for the giveaway!! I would get the french terry. Love that it is organic! I would get the knit stach! SO cute!!! This is all so lovely, Mie! I have the Hawthorne pattern and when the weather gets cooler, I'll definitely be sewing a few. So pretty! I love all the twill colors...I would buy a bunch! You did a beautiful job. I love the jacket and the dress is absolutely adorable. Beautiful creations as always! Love the jacket, curved pockets with flower print peeking...just perfection! I see they have some lovely flower prints,I would love to have some of those! I think I would get some of that lovely elephant knit! I have never had organic knit fabric, just quilting cotton. i love the baby rib knits - gorgeous colors! 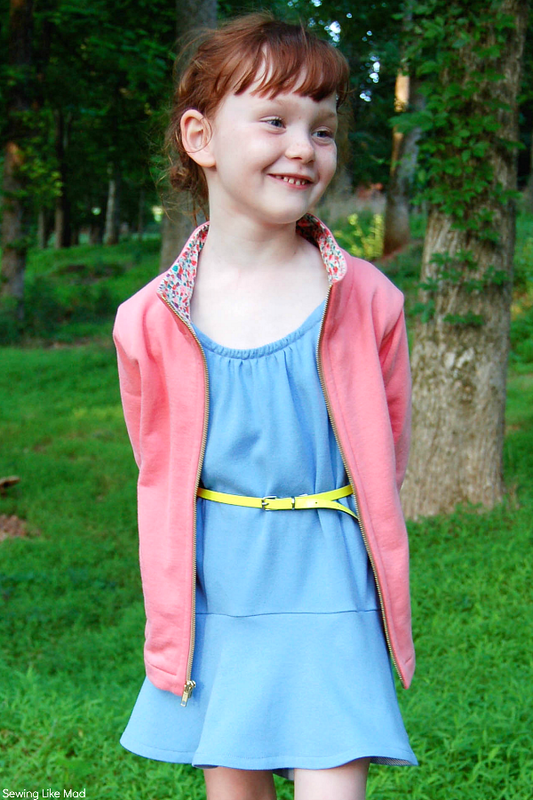 You did a nice job on the dress and fleece jacket - pro! and your adorable model is a natural for modeling! I love the Sateen-60"-Pink-230TC - I've been wanting to make a duvet for a comforter and some matching throw pillows!!! Thank you so much for the post and give away. Love the bias binding and flounce. I would buy some knits. Gorgeous! The Hawthorn's pockets and color and those dress sleeves are perfection, Mie... You are so good at this! Oh, and I would get anything with stripes or floral... :) Interlock or french terry. Mie! The colours on this outfit are amazing, especially that gorgeous blue. I love the Hawthorn mix up and the little floral accents. Amazing. I would find it very hard to choose - maybe some twill or fleece. Glad to read your reviews as I was just on their site looking at fabric for some of the patterns for the Craftsy class on sewing with knits! So pretty!!!!! So many project options! I really love the contrast collar in the jacket and pockets - clever to reduce the length, it looks so much better with the dress. I think I'd have to go with some baby rib to do a fitted, cropped top. I love knits for lightweight, soft baby blankets. 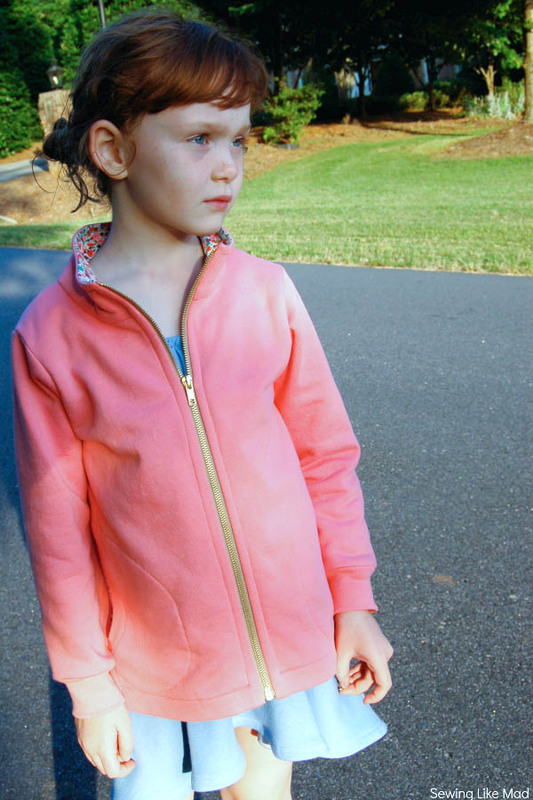 I need some pretty colored sweatshirt fleece for my daughter who wants pretty girl colors and not boring black, gray, or white which is all that is available locally and she totally needs something super soft. I've never sewn with organic cotton - sounds sweet! I would make an outfit for my co-workers new baby! I think I'd make myself a dress out of arctic paisley. Beautiful. I would chose the organic cotton. You do beautiful work. Thanks for the chance. Aha what wouldn't I buy! I'm in the market for some light cotton or knit as I desperately need maternity clothes... am torn between pink stripe interlock and the sweet jane purple flower print! ummm tough decision. the baby rib in turquoise with the stripes caught my eye! Thanks for the great giveaway! and great little outfit by the way- love every little detail! Love the jacket and how you did the pockets. I love the Mod Squad fabric. So cute and fun. Thank you! I love the interlock Retro Squares. That knit looks great. I think I'd make a comfy dress for traveling. Sooooo beautiful!! The dress, the girl, the sweatshirt ;) Looove the sleeve finishing, it's just stunning. And the floral accent on the Hawthorne is perfect too. You can definitely come live in my house and then you can teach me all your ways, haha :) I'll be honest and say I have no idea what I would choose from their store. Everything looks so amazing and I'd change my mind a hundred times before I'd settle on something! I do really, really love their twills, so definitely one cut of one of those. The sweatshirt fleece sounds awesome. :) Great outfit, perfect for a child! Love the pockets. I would buy one yard of all the knit fabrics. I love to sew with knits but is hard to find them in my area. It would be so hard to choose. Probably the soon to arrive elephant print interlocks or just a nice solid knit. I have a whole list of knit items I want to make this summer. I've been searching out the perfect sweatshirt fleece for a Hawthorne jacket so that's at the top of the list. This looks like such yummy interlock and I love that it's organic. I have been itching to try my hand at dying and block printing, so I would probably buy some natural voile and dye and give it a shot! The fabric is so beautiful, it makes my list of things to make seem endless! I'd buy some of their organic jersey!! Love their shop. Some linen and maybe some silk! Ooh the baby rib- coral looks soo comfy, I would want to try it! It would be so hard to choose! There are some lovely colors of interlock and thermal though. Probably one of those. Hmmmm tough question! I love the twill in marine blue and hibiscus. I would also love some interlock maybe the grey waverine and the marigold butterfly. I like the idea of organic with fabrics as well as veggies and fruits. Great give away! Would love to win. I think I'd get some interlock dottie! I love the jacket you made your daughter - might have to make one for mine! i'd buy knits - esp some of that green vine interlock! I would scoop up some of that stretch jersey dynasty west dots in black and white. Super cute! I would pick up some french terry in Roswell Desert! I Love french terry, and that color! This outfit is perfection, Mie!!! I love the apricot interlock! Your sweater construction is so lovely, the details are a thing of beauty. They have an awesome selection of twill! I would buy them all if I could! Arctic Paisley Pizzazz knit, Cornflower Butterfly knit, and Sateen Whispering Grass Blue! I love the sweatshirt! I wish I could make in my size! If I won the gift certificate, I would definitely use it to make a blanket for my baby's first birthday, which is in a couple months. The kind of blanket you keep for life and pass down. Their fabrics would be perfect for such an important item. I would get a striped knit fabric, can't go past classic stripes! I would buy a variety of fabric . The sweatshirt is very cute. I might try that... for myself. Don't have any little girls to sew for ...my son might protest.. he's 17. You are so talented! I love organic cotton! I saw some gorgeous paisley flannel over there !! Hmmm...probably the natural French terry...gorgous! Love you blog...new here! Wow what a great give away! I would defenitely order some interlock and jersey colors to build my stash. And if there is some money left I would order some flannel for kids payama's or printed jersey. O boy, they have so many beautiful things it's hard to choose! I would probably get some Interlock-46"-Ellie Fam Multi. Adorable! And maybe some lace, too. I would buy some of that gorgeous organic knit!! They have so many options!!! I love the paisley print!!! 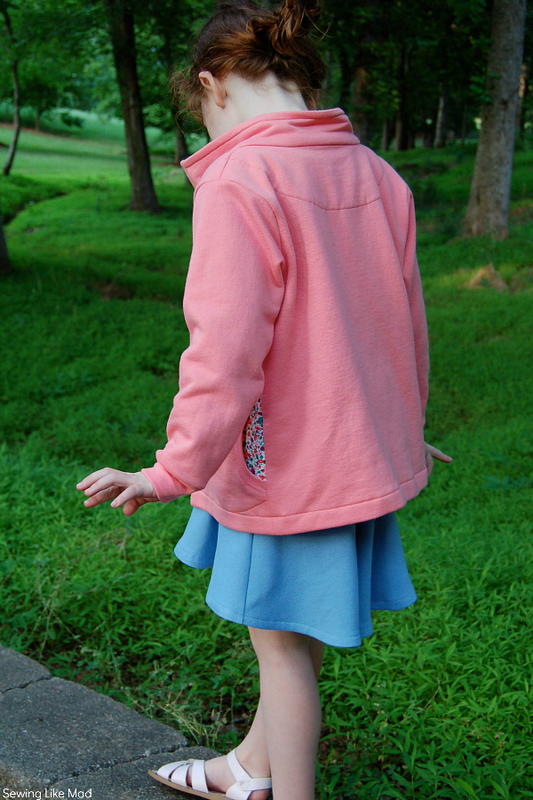 Love the darling peachy sweatshirt, it would look so sweet on my little redheaded granddaughter, Chloe Jane too. There are some beautiful knit prints, as well as a coral baby rib that I like. That jacket is absolutely gorgeous! I think I would get some solid knits! I would.purchase interlock fabric to makes lots of clothes!! I would pick the interlock I think. There are some adorable prints that would be good for my boys (do you know how hard it is to find non girly prints?!?) I love the bicycles and elephants especially. I would love either the Linen Retro Lime or any of the beautiful Peace Silks! I would HAVE to have a yard of Morning Dew muslin, and then some buttons, and maybe some ribbon. Oh the choices!!!!! I would definitely get some of the Ellie Mae in multi and some coordinating fabrics to match to sew something up for my girls! I love the outfit, beautiful. If I won the $50, I would love to try some of the interlock on a couple of little dresses, I'm feeling the dark blue, plum, and violet (I've been too scared to try knit, but I'm ready to get over it). I would also love some hemp to sew up some simple lounge pants for the kiddos. I am just learning to sew with knits, so I would probably buy some of those. thank you! I like the ragg tagg muslin.. I'd probably buy some of that. I would get some of the Jersey Knit-Monk! Your dress and jacket are so cute!! Thank you for having this giveaway! I would order the knit prints. Especially the mustaches! To sew leggings for my daughter and shorts for my son. (I don't think my first comment published.) Thank you for this giveaway! I would love the staches interlock as well as the dottie! All so cute! I love OCP and am so glad they partnered up with Near Sea Naturals-- I need a bunch more of their delicious natural jersey! Style That Kid! - eBook Review. 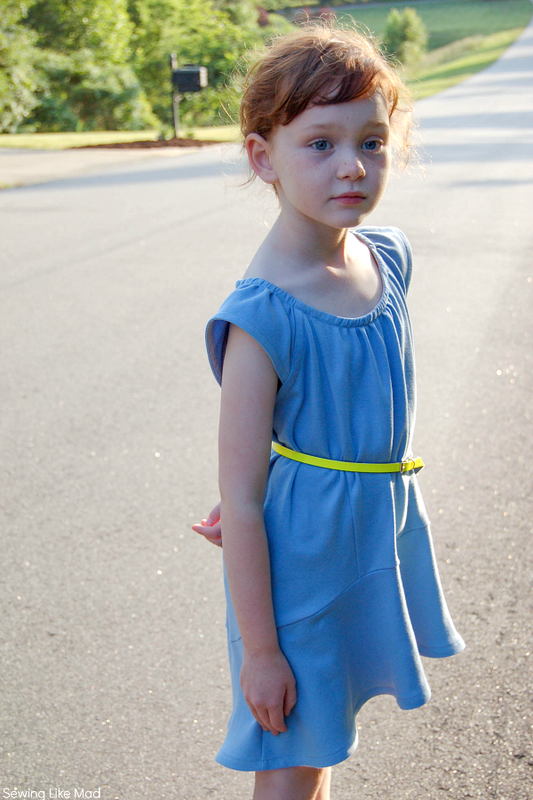 The Soleil Dress by Selvage Designs. $150 gift card to The Ribbon Retreat - Giveaway.